If you are curious what life is like in Vietnam nowadays, prepare to be unpleasantly surprised. After 35 years of Communist rule Vietnam’s condition is worse than ever, comparable even to the French occupation of Vietnam from the 19th to 20th century. Citizens living in the Socialist Republic of Vietnam are always under surveillance by the government, unlawful arrests are common, and the rule of law is non-existent. Even in 2010, the government still closely monitors the actions of its people and tightly controlling the flow of information. Bloggers and writers are arrested endlessly, and religious groups are cracked down regularly. It seems all the Communist government is worried about is protecting it’s own feeble hold on power, disregarding the needs of their own people. Thanks Ho Chi Minh, for creating a tyrant Party, destroying the foundations of a great country and ruining a once proud Vietnam. Depending on who you talk to, opinions about President Ngo Dinh Diem can range from being very positive to not-so-positive. As the President of South Vietnam, Diem was faced with much scrutiny and criticism for his mistreatment and discrimination against non-catholic citizens. Another problem with President Diem is the nepotism that is evident in his government. Ngo Dinh Diem gives government positions to his family members, arguably turning his administration into an authoritarian family. For these reasons, one can look at the image of President Ngo Dinh Diem with a sense disapproval and contempt. On the other hand, one must also look at the contributions of President Diem to Vietnam in order to see the big picture. Under his presidency, the Republic of Vietnam was a very prosperous place. Schools were built, roads were paved, jobs were created, the economy developed rapidly, and the Communists were held at bay. It is true that Ngo Dinh Diem made some dramatic errors during his term as President, but he also leaves a legacy of prosperity and independence that Vietnam has never again experienced since the Communists takeover in 1975. It is sad to think about how Vietnam could have turned out if Ngo Dinh Diem had never been assassinated. If one condemns him for his mistakes, then one should also commend him for his accomplishments. 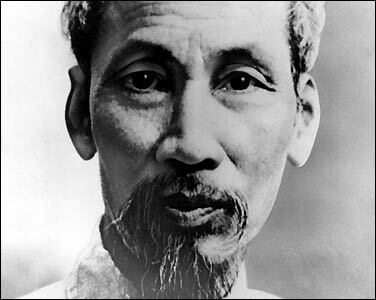 One of the most “prominent” figures in Vietnamese history has to be Ho Chi Minh. He is the man who established the Viet Minh group, and later on the Viet Cong. His reason for creating the Viet Minh was to expel the French colonists from Vietnam, ending their 80 years of occupation. This seems to be a noble cause and in many ways, it is. However when one looks at the choices Ho makes in his personal and political life, the evidence paints a different picture. After all, Ho Chi Minh is the man that brought Communism to Vietnam and under his leadership, millions of Vietnamese lives were lost. When Ho rises to become the President of North Vietnam, he draws up arms against the democratic South Vietnam and ultimately drags the country into a civil war that lasts for over 20 years. The ideology that Ho Chi Minh and his Party inflicts upon Vietnam will prove to be severely detrimental to the country, even to this day. Presently, the Communist Party is still in power, suppressing and cracking down on anyone who doesn’t share the same ideas as the Party itself. Democratic activists are jailed, religious groups are targetted, and the Communist government is hopelessly corrupted. The subject of Ho Chi Minh is controversial and extremely complicated, but when one looks at the direction that he leads the country in during his rule, and the disastrous results of the Communist takeover, it is obvious that Ho Chi Minh has done far more harm than good for Vietnam. This blog is dedicated to the promotion of human rights and freedoms that the people of Vietnam, along with many other dictatorships, are sadly deprived of. The Communist Party of Vietnam constantly supress and abuse the Vietnamese people. They are a corrupt government that takes the interest of the Party before the interest of their own citizens. Fundamental rights such as freedom of speech, religion, gathering, and expression are all banned in the Socialist Republic of Vietnam. I simply want to provide the facts relevant to Vietnam and express my opinions on these particular topics. I’m sure not everyone will agree with my views and that is perfectly normal. Anybody is free to leave their opinions, the most important thing is that you enjoy what you read and leave this page with something insightful to think about. I’m new to this blogging thing so I really hope you enjoy it! Welcome to Freedom For Vietnam! I hope you enjoy your visit.